25 ¢ The MULLET RAPPER Whats Happening in the Everglades City Area JANUARY 17  30, 2014 2014, Snook Publications P O Box 617, Everglades City, FL, 34139 Volume VIII Issue #203 COUNTY VOTES TO KEEP MAMIE STREET On Tuesday, January 14, the Board of County Commissioners held a Public Hearing about vacating Mamie Street south of Chokoloskee Drive. Residents of Chokoloskee as well as supporters from around the state spoke in opposition to the proposed resolution. The attorney for Florida-Georgia Grove, LLP, said there were two options for the BCC: either vote on the resolution to vacate the road or adjourn the meeting and let staff and counsel to convene to decide later on the alternative plan which they just introduced. After over two hours and 19 speakers from the public, the Commissioners by a vote of 3-2 decided not to prol ong the decision. With another motion, they unanimously voted to reject the resolution. In other words, Mamie Street is still a County road! Now, what lies ahead for Mamie Street? To Be Continued . CITY COUNCIL REPORT by Marya Repko Mayor Sammy Hamilton reported at the meeting on January 6 that we did a lot last year but well do better this year, which is hard to do. He said he was proud of the City with all its parades and community spirit. As for water breaks, he is working on that. And, he is now even more involved in the upgrading of our water system. There was a discussion about a resolution to prohibit parking on the medians where the sprinklers are. The Mayor explained that the cost to fix them was prohibitive and cars shouldnt be parked there. A resolution was passed that there would be a $200.00 fine for stopping on, parking or driving on the medians from bridge to bridge and on Copeland Avenue (except during the Seafood Festival). The Mayor thanked Lt. Mark and Crime Pr evention Office Sue Ge ntry of CCSO for all they do for our City and surrounding areas. Lt. Mark Milligan reported that the crime scene had been quiet but there were false reports of dogs being poisoned which were not confirmed by the owners. If you think your dog has been poisoned, he asked that you phone 252-9300. As for community involvement, kids were taken for Christmas shopping and then sang carols at a retirement home in Naples. During Seafood Festival, th ere will be extra deputies and CR-29 might be made one-way out of town if there is gridlock. The next City Council meeting is on Tuesday, February 11, at 5:30 p.m. S S E E A A F F O O O O D D F F E E S S T T I I V V A A L L PERFORMERS ANNOUNCED! Theres a stunning star collection of musicians for our annual (the 42nd) festival on the weekend of February 7/8/9. They include Nashville chart-toppers Parmalee whose hit album Feels Like Carolina stems from their pr actice barn in Parmele in North Carolina. The brothers Scott & Matt Thomas, cousin Barry Knox, and friend Josh McSwain have hit the big time with their Country Music, signing up with the Stoney Creek Records label. They will be on stage here in Everglades City on Saturday. But, there are also some local groups on the schedule like The Gladezmen, Them Hamilton Boys, and our own Houston Brown plus Angela Marsaglia with South 41. The Festival ends, as it did last year, with the popular Jimmie van Zant. The LaBelle Dance Company is also performi ng and Casey Weston will be there, as will be Tim Elliott, the Grayson Rogers Band, Brad Anderson, The Tim Charron Band, and Lets Hang On. 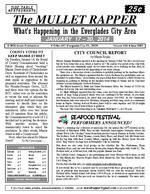 For the full schedule info, see ww w.evergladesseafoodfestival.org. If you would like to be a sponsor and be associated with these great groups, youll get lots of publicity that thousands (about 40 ,000) will see over the weekend. Visit the Festival office behind Island Caf from 1:00-4:00 p.m. or download an application form from the website. All the proceeds are donated to the local commun ity. For more info, phone (239) 695-2277. TIDE TABLE RESTAURANTS CONTENTS Calendar p. 2 Visiting Students p. 8 Events p. 3 Recipe p. 8 School p. 5 Health p. 8 Parks p. 7 Museum p. 9 FWC p. 7 Everglades Arts p. 9 Gulf Coast p. 7 Florida Tales p.10 Sheriff p.7 Savannah p.10 TIDES & RESTAURANTS p.11 CLASSIFIED p.12 FEATURE: Belle Starr, p.9 If you have news, photos, announcements, or articles ... email mulletra pp er @g mail.com or phone 695-2397. The MULLET RAPPER Whats Happening in the Everglades City Area JANUARY 17, 2014 email: mulletrapper@gmail.com PAGE 3 www.evergladesmulletrapper.com Lasagna Dinner The Ladies Auxiliary of Everglades Community Church will host a Lasagna Dinner on from 5 to 7 pm on Friday, January 17 Tickets are the $10 for adults and $5 for children under 10. Tickets are available at the Chok oloskee Post Office. PANCAKE FLY-IN A pancake breakfast hosted by Wings 10,000 Islands Tours will take place at Everglades Airpark on Saturday, January 18, from 10:00 a.m. to noon. Everyone is welcome. Call 695-3296. ART-IN-THE-GLADES Support local vendors on Saturday, January 18, 1 0 a.m. to 2 p.m. in McLeod Park. There will be live music, thanks to Snooker Joe Stem, and food for sale at lunch time. Everyone is welcome to set up a table at no charge so if you want to hold a bake sale or have craft works to sell, phone Marya at 695-2905. Festival in the Woods Picayune Strand State Forest Sabal Palm Hiking Trail Trailhead Saturday, January 25 10 am to 3 pm Guided Hikes Wildlife Presentations Guided Bicycle Tours Kids Activities For info, call Heather L. Ferrand, Forester Caloosahatchee Forestry Center (239) 690-3500, Ext. 121 or Heather.Ferrand@FreshFromFlorida.com Postal Rates Increase Rates go up January 26 but the "forever" stamps are still valid. A first-class letter will now cost 49¢ BLOOD DRIVE Tuesday, January 28 Everyone Welcome No Appointment is Necessary Everglades City School 10 a.m. to 1p.m. ORA in Chokoloskee 3:00  5:30 p.m. For info, call Jennifer (239) 734-0737 GOSPEL MUSIC NIGHT 1st Baptist Church of Everglades will hold a Gospel Music night the 3rd Sunday each month at 6 pm. Local and visiting musicians ask you to join us for an evening of praising God through music and fellowship. Refreshments following. Contact Pastor Jim Fross (239) 695-3871 or evergladesbaptistchurch@gmail.com. Chokoloskee Winter Fest Church of God Winter Festival will be held from 9:00 a.m. to 3:00 p.m. on Saturday, February 1, with items for sale, raffles, auctions, and fish fry. For more information, please call 695-3735. STARRY, STAR RY NIGHTS View one of the darkest night skies by attending ranger-led astronomy programs Saturday, February 1, at 7:00 p.m. at Big Cypress National Preserve. For more information, call 695-1107. Jammin in the Hammock 7th Annual Bluegrass Festival Collier-Seminole State Park Saturday, February 8, 10 am to 5:30 pm Sunday, February 9, 9:30 am to 5:30 pm www.floridaparks.org or (239) 394-3397 Collier-Seminole Canoe Trips Guided Canoe Trips on Mon, Wed, Fri and Sat starting at 9:30 a.m. The next Full Moon Guided Canoe Trips are at 7:30 p.m. on February 12 & February 13 Call (239) 394-3397 for more information. Art in the Preserve The Friends of Fakahatchee will offer En Plein Air each month during season. For information, visit www.orchidswamp.org or call Karen at 695-4593. The 10th Annual Marjory Stoneman Douglas Festival February 18 22 Museum of the Everglades Call Martha at 695-0008 for reservations www.evergladesmuseum.o rg/EVENTS.htm EVERGLADES BOOK CLUB Thursday, February 20 "Miss Dreamsville & The Collier County Literary Society" by Amy Hearth Hill Call Sue at 695-9173 for more info Everglades Ultras Trail Race thru the Everglades Fakahatchee Strand will be the place for all runners on Saturday, February 22, with three distinct races: 50 miles, 50 km, and 25 km. For more information, visit www.evergladesultras.com, or email Bob Becker at bob@ultrasportslllc.com, or telephone (954) 439-2800. OCHOPEE FIRE CONTROL DISTRICT 12/30/13: Mutual Aid (Brush Fire), 20200 TTrail 12/31/13: Emergency Med, Everglades City 12/31/13: Emergency Medical, Copeland 12/31/13: Vehicle Accident, 78 MM I-75 01/01/14: Emergency Med, Everglades City 01/01/14: Mutual Aid, Marco Island 01/01/14: Mutual Aid, Marco Island 01/02/14: Vehicle Accident, 50 MM US 41 01/02/14: Vehicle Accident, Ochopee 01/04/14: Emergency Medical, Copeland 01/04/14: Vehicle Accident, 59 MM I-75 01/07/14: Emergency Med, Port of Islands 01/08/14: Emergency Med, Port of the Islands 01/10/14: Emergency Medical, Carnestown 01/10/14: Emergency Med, Port of the Islands 01/10/14: Emergency Medical, Ochopee 01/11/14: Emergency Medical, Everglades City 01/13/14: Vehicle Accident, Everglades City The next Ochopee Fire Control District Advisory Committee Meeting will be Monday, January 13, at 4 p.m. in the Port of the Islands Realty Office in East Naples. DOCTORS CLINIC Dr. Kirk DeMartino will see patients in Everglades City every Friday from 1:30 to 4:30 p.m. in the office behind the Fire Station. If you have any questions, call (239) 642-5552. Little Gator Clinic The free walk-in clinic behind the youngsters will be open Tuesday, January 21, and February 11 and 18 from 5 to 7 pm when Dr. Barnard and Kathy will see patients aged 18 and under. There are no drugs on the property but Dr. Barnard can write prescriptions. Weight Loss and Support Group (with Christian views to healthy eating) will meet every Wednesday from 5:00 to6:00 pm at the Community Church. No charge and everyone is welcome. For info, call Kathy Kronk at (573) 619-9929. Al-Anon Family Groups Al-Anon Family Groups offers support for families and friends troubled by someone else's drinking. Local phone 263-5907 or 1-888-425-2666 for 24/7 information. See schedule at SouthFloridaAl-Anon.org. Al-Anon in The Glades meetings to begin January 28 and meet on Tuesday mornings at 8:00 a.m., Everglades Community Church Fellowship Hall. The Thursday at Noon AFG recently celebrated its 2nd Anniversary here in the City. Meetings are held at the Community Church on the Circle, Thursdays from 12 noon to 1:00 p.m. The MULLET RAPPER Whats Happening in the Everglades City Area JANUARY 17, 2014 email: mulletrapper@gmail.com PAGE 7 www.evergladesmulletrapper.com Everglades National Park Gulf-Coast Programs The following Ranger-Guided Activities for the season are now being offered free of charge : Nature Walks, Natures Notebook Boat Tours, Canoe Explorations, Bike Tours, and Ranger Talks. For more information, call 695-3311. Ghost Rider Tram Tours The Ghost Rider Tram Tours for January are sold out! Book now for February or March with the Friends of Fakahatchee at their website www.orchidswamp.org. Comment Period Extended for Backcountry Access Plan Scoping Big Cypress National Preserve has extended the public scoping period for a backcountry access pl an and environmental impact statement (EIS) being prepared in compliance with the National Environmental Policy Act of 1969 (NEPA). The comment period will be extended until February 28th, 2014 in response to a request from the public for additional time to review and comment on the scoping newsletter. The purpose of the plan will be to provide off-road vehicle (ORV) secondary trails, non-motorized trails, and a camping management approach that protects the Preserve 's natural and cultural resources while providing for public enjoyment. The plan will also establish a permanent route for the Florida National Scenic Trail and other hiking opportunities. A scoping newsletter providing further details on the plan is available at http://parkplanning.nps.gov/projectHome.cfm?projectID=49334. Please submit your comments online at http://parkplanning.nps.gov/projectHome.cfm?projectID=49334 or mail to Superintendent, Big Cypress National Preserve, 33100 Tamiami Trail East, Ochopee, FL 34141-1000. If you have questions, please contact Bob DeGross at 695-1107 or email bob_degross@nps.gov. FWC News Fewer Florida panther deaths in 2013 In the world of the endangered Florida panther, 2013 brought less mortality, a female panther succes sfully released back into the wild, and significant public participation in reporting panther sightings. Twenty panther deaths were documented by the Florida Fish and Wildlife Conservation Commission (FWC) in the past year, compared with the 27 panthe rs that died in 2012. Vehicle strikes continue to be the primary cause of mortality, with 15 panthers dying last year because they were hit while crossing highways compared with 18 in 2012. The birth of 21 panther kittens also was documented in 2013. More about Florida panthers is available at FloridaPantherNet.org, including A guide to living with Florida panthers and the E-Z guide to identify panther tracks. For wildlife info and regulations, see www.myfwc.com Wildlife Alert Hotline: 888-404-FWCC (3922) Angler Tag Return: 800-367-4461 Living Gulf Coast by Charles Sobczak American Cockroach ( Periplaneta americana ) Other names: palmetto bug, waterbug / Status: FL=thriving, IUCN=LC / Life span: to 1 year / Length: 1.2-1.6 in. (3040 mm) / Reproduces in the damp under story, sabal palms and the crawl spaces of our homes, condominiums and businesses Found: Regrettably, the American cockroach is found just about everywhere in the Sunshine State. While this common insect has an American name, its origins are believed to be rooted in Western Africa, arriving to North America as a stowaway as early as 1625. Most entomologists think that it crossed the Atlantic during the era of slave ships where the wretched conditions provi ded ample food for an insect whose dining preferences include carrion and raw sewage. The cockroach is a survivor. An cestors of todays cockroaches date back to the Carboniferous period, originating some 360 million years ago. Their ability to withstand lethal doses of radiation, toxic levels of chemicals and a host of other conditions that would kill most other living things, makes the future of this enduring insect secure well into the distant future. In Florida the American cockroac h is kindly referred to as the palmetto bug. In New York, where it is common inside of buildings, they refer to it as a w aterbug. The adage, a rose by any other name is still a rose, applies equally well to roaches, but its easier on everyone concerne d to say your house has a palmetto bug infestation than to admit your house is full of roaches. Cockroaches are common in th e wild where they feed in garbage bins, rotting wood piles and in the thick under story of the wetlands. The American cockroach is not cold tolerant and will retreat into homes during excessive cold snaps during the winter months. In the north they compensate for this by spending most of their lives in sewers, basements and wall cavities. A female cockroach will produce an average of 150 offspring during her one year life cycle. Although a scourge on humans, cockroaches are a favorite food of many birds, mammals and lizards. Fire ants prey upon them all the time, biting them en masse, killing, then devouring all but the exoskeleton. Although they appear to be able to run at twenty miles per hour when you are chasing them with a newspaper, it is only an illusion. The University of California at Berkeley registered a record speed of a mere 3.4 mph. The illusion is created because that equates to 50 body lengths per second. If an Olympic athlete c ould match that number, they would be running at 205 miles per hour. This article is an excerpt from Living Sanibel-A Nature Gu ide to Sanibel & Captiva Islands by Charles Sobczak. The book is available at Barnes & Nobles, all Island bookstores, Baileys, Jerrys and your favorite online sites. Charles Sobczak lives and writes on Sanibel Island. To find out more about the author and his books, visit www.indigopress.net SHERIFFS REPORT Should you have any information concerning crimes, please contact the Collier County Sh eriffs Office at 252-9300. The MULLET RAPPER Whats Happening in the Everglades City Area JANUARY 17, 2014 email: mulletrapper@gmail.com PAGE 8 www.evergladesmulletrapper.com VISITING STUDENTS Twenty-three 7th grade students from Gulfcoast School in Delray Beach were here December 3-5, enjoying a visit to the Everglades with thei r teacher Bryan Cook. This is the 11th year that Bryan has brought his students for kayak tours (including sunset and stay at Ivey House) and bikes rented from Naples Bike Shop Big Mommas with a tour to Chokoloskee and the historic Smallwood Store. Lunch of sub sandwiches in alligator lunch boxes with cookies and chips and alligator cupcakes was catered by Deborah Trujillo. Calendars donated by Clyde Butcher and books donated by Marya Repko were given for their school library. Afterwards some students played basketball and on the swings while others chose to make a trip over to the Museum and had a short lecture from Tim England before heading home. They also had dinner at Camellia St Grill. WELCOME RECEPTION The Captain's Table Lodge is hosting Friday afternoon welcome sessions from 4:00 to 6:00 p.m. when local businesses will be able to talk with visitors about what there is to do in our area. Everyone is welcome. For info, call 695-4211. HIGHWAY CLEAN-UP Along with some very dedicated winter residents, the Ladies Coffee and ESHP are cleaning up Highway 29 north of the bridge every Thursday at 8:00 am. Come join us. Call 695-4642 for more information. Veterans Support Group The Veterans Administration is here every two weeks to answer questions regarding benefits, etc. For more information, call (239) 403-2377. Recipe for Good Eating Donnie Barton Gotta Go Soup Submitted by Jane Rackley Ingredients 1 soup bone, jar or two of spaghetti sauce, jar of tomato sauce, water, some frozen mixed vegetables, vegetables, chop up some fresh steak or use leftovers, fresh onions, dash of Texas Pete, barley, dash of Worcestershire Sauce, potatoes, shake of ketchup, carrots, broccoli, fresh kale, tomatoes, fresh cabbage, black-eyed peas, fresh garlic, black beans, fresh corn cut from cob, lentils This recipe is a good way to use up all the leftovers you have in your refrigerator in the New Year. It is dedicated to Donnie Barton because he really knew how to recycle, and he was generous with whatever he had. He once made vegetable soup with whatever vegetables were in the house. It was the most delicious soup he had ever made. Start the soup bone simmering in water. Add fresh onions, garlic, carrot, potatoes, whatever will take longest to cook. This soup is going to cook all day, either in a HUGE pot on top of the stove, or a slow cooker. Keep adding vegetables when you find them. I added home-canned green beans, spaghetti sauce, Texas Pete sauce, tomato sau ce, whatever I could find in the cupboard. Add barley, but, remember it will swell and youll have to add more water. Keep tasting soup as it cooks, and add whatever y ou think it needs. Just before you get hungry for supper, add lots of fresh cabbage and or fresh kale. Because you will have a generous pot or two, share jars of it with your friends. If you have a favorite re cipe to share, please phone or email us. Patty Huff Health, Wellness, and Green Living by Shannon Snyder The Importance of Stretching Why is it important to Stretch? I cannot emphasize enough how important it is to stretch all your muscle groups on a daily basis. Any of my clients who see me regularly for massage therapy know I will give them stretching homework. We all seem to be focused on cardiovascular workouts and strength training which is great! However, stretching is just as important to keep muscles healthy. Muscles, like other tissues in our body, need to be well circulated and healthy. We spend most of our day in the same posture. By not stretching, we continue to overuse and fatigue our muscles, making them short and tight. In return, we form adhesions and connec tive tissue that is not needed, decrease circulation, decrease flexibility, increase the risk of tendonitis, increase aches and pain. The typical muscle groups that are affected are: Low back Upper back Neck Forearm Hip and pelvis Chronic stress, repetitive movements and sta tionary postures lead to decreased blood circulation, weak and tensed muscles and finally adhesions. Muscles also start forming trigger points. A Trigger Point is a hyperirritable spot in skeletal muscle that is associated with palpable nodules in taut bands of muscle fibers referring pain elsewhere. (I covered this in a previous article.) Stretching can re duce muscle tension, increase range of motion, increase circulation of blood which can incr ease energy levels, and stretching can also decrease your risk of injury. A common problem that a lot of people are f aced with is caused by computer use and bad posture while sitting at their desk. Over a period of time this can lead to Long term muscular changes Tight pectorals & upper back muscles Weak anterior neck muscles & mid back muscles Symptoms can include headaches, tension in shoulders and neck When stretching your muscles, always remember to hold the stretch of at least 20-30 seconds and repeat at least 3 times every day! Stretching will take very little time from your day and in return will keep your muscle s healthy. For some how-to stretching go to wikihow.com/stretch. Shannon Snyder lives in Everglades City with her husband Billy, their two sons and their dog Ruby. She is the owner of Driftwood Spa offering massage therapy and spa services. The MULLET RAPPER Whats Happening in the Everglades City Area JANUARY 17, 2014 email: mulletrapper@gmail.com PAGE 9 www.evergladesmulletrapper.com MUSEUM of the Everglades The Wild Blue Ocean by Carey Chen The current exhibit by Marine Artist Carey Chen (shown above with a visitor at his recent reception) continues at the Museum throughout this month. Please stop by for a visit. The Museum is open Tuesday through Friday from 9:00 a.m. to 5:00 p.m. and on Saturday from 9:00 a.m. to 4:00 p.m. There is no admission fee but donations are welcome. ESHP News The next meeting of the Everglades Society for Historic Preservation will be on Monday, February 3, at 8:30 a.m. in City Hall. High on the agenda are plans for the Walking Tour of Historic Chokoloskee in March. Everglades City Building Inspector Joe Sprecht will be speaking about historic buildings in the City at a date to be announced. The Everglades Varicks recent paintings Show dates January 3  January 25 Everglades Arts Varick Niles Studio 110 Camellia Street, Everglades City Studio open Fridays & Saturdays 11:00 am 4:00 pm, November  April www.varickniles.com (239) 261-9592 BELLE STARR  WAS IT EDGAR A. WATSON? by Charles Raney (Continued from January 3 issue of The Mullet Rapper ) This now leads us to the Belle Starr  Edgar Watson connection. Edgars exploits in Florida are well known, especially in the Ev erglades area, and written about in detail, including how he met his death at the Smallwood Store, Chokoloskee, Florida. Now Watson and his connection to Belle Star rs murder all takes place in Arkansas and the Indian Territory from the spring of 1888 to April 1889. Its true that Belle Starr ran with the bad boys, that she did not like to be around people, that she packed an ivory handle pistol and bought her clothes at the Boston Store in Fort Smith, AR, but she did not deserve to be murdered. Only Belle knew who killed her as she probably caught sight of him when he came over the fence to shoot her close up with a second blast of the shotgun. The ambush and the way killed indicates someone had the passion, anger and propensity to kill but who also respected her crack-shot ca pabilities, thus the ambush method. This was more of a professional type assassination. There were three creditable suspects in the murder of Belle: 1) Eddie Reed: Son of Belle Starr. Supposedly Belle had taken her ever present quirt (whip) and severely beat her son for mistreating one of her favorite horses. I cannot agree with the notion that her son killed his mother. The son lived miles away and had seen little of his mother in months. Eddie may have been upset with Belle, but there were many occasions in his life that his actions also caused tension between the two. Eddie became a Deputy U.S. Marshal for a while but reverted to his outlaw ways and was killed in a shootout. 2) Jim July Starr: Belle had ridden half way to Fort Smith with Jim as he was being encouraged to turn himself in to Judg e Parker for pending charges. Belle was ambushed on her way back home. Jim was notified of her death while he was in Fort Smith and rode the 80 miles back to her home nonstop. There are those that think Jim July was jealous of someone Belle might have been seeing and that was the reason for his killing her. Most do not consider this to be accurate. Later, Jim July was threatening a Deputy U.S. Marsha l and the Marshal caught up with Jim, asked him to surrender, and when Jim refused he reached for his gun but the Deputy Marshal drew first and wounded Jim July. July was taken to the Federal jail in Fort Smith where he died from his wounds. 3) Edgar Watson: Watson was arrested by Jim July Starr (citizens arrest) and he along with his Indian friends were convinced to take Watson to Fort Smith for trial before Judge Parker for the murder of Belle Starr. This they did and Watson was tried, but those that did come forward only supported Watson. Belles son Eddie Reed refused to come forward to te stify. There were no actual witnesses to the murder. Watson was acquitted and released in April 1889. This author is convinced th at the one man with the strongest motive, opportunity, and affinity to commit this murder of Belle Starr was Edgar A. Watson. This belief is shared by several publications on Belle Starr and by those that to this day continue to learn and study the life and times of Belle Starr. (Article to be continued in next issue) Photo shows Chuck Raney (author) holding Be lle Starrs 44/70 rifle at Belles grave. Dr. Hood to the right owns Youngers Bend where Belle is buried on her old homestead. Belle was murdered just 1 mile from her home. She was buried in her front yard. Chuck Raney is Past President of the Fort Smith Historical Society, retired military, local historian and researcher. He has done extensive research on Belle Starr and Edgar Watson connection and gives talks and tours of Youngers Bend, Belle Starrs old homestead and where she is buried in Oklahoma. The MULLET RAPPER Whats Happening in the Everglades City Area JANUARY 17, 2014 email: mulletrapper@gmail.com PAGE 10 www.evergladesmulletrapper.com Florida Tales Cattle Rustlers by Chester Keene Cattle rustling in Florida or any other state was not a good business to be caught doing. Back in 1896 a few bad men ran off with a few hundred head of cattle from south central Fla. Some ranchers that the cattle were stolen from mounted up and pursued them. They trailed them up to arou nd the central part of the state to a slaughter house. The hides from some of the branded cattle were there, still with their brands on them. This really got them riled up and they headed off towa rds a place north of Okeechobee on their good horses where they got the word to the Sheriff and some of his deputies. The Posse then rode at neck-break speed towards a hideout in the swamp where no one in their good mind would take a horse, much less try to walk it. The Posse tied blankets on the hooves of the horses to keep them from sinking belly-deep in the muck. The rustlers had crossed over into another county by now. They woke up the owner of a nearby ranch and some cowhands to join in. Very shortly they ran into the rustlers. The cattle were rounded up along with some of the cattle thieves after the gunfire had stopped. Another Posse of a dozen ranchers from the County they were in got there right after the gunfight. Most of the cattle brands had been altered with a Running Iron. Now that was a double penitentiary crime for that: Five years for stealing and five years for altering the brands. Cattle rustling was not looked upon too lightly. Chester Keene is a retired law enforcement officer and Florida native. He retains the copyright to this article. The Mullet Rapper listed in Florida Digital Newspaper Library The Florida Digital Newspaper Library exists to provide access to the news and history of Florida. All of the over 1.5 million pages of historic through current Florida newspapers in the Florida Digital Newspaper Library are openly and freely available with zoomable page images and full text. Floridas newspapers are a state treasure, the historian's and the genealogist's best friend, and th e community's co llective memory. In the world of newspapers, today's news is already history, from the moment their stories are printed. The Florida Digital Newspaper Library builds on the work done in microfilm within the Florida Newspaper Project. To view the librarys website, visit www.ufdc.ufl.edu/fdnl1 and type in Mullet Rapper to search for our local newspaper. We are honored to be included in this digital library. From Savannahs Eyes Happy New Year everyone! I hope you all had an amazing and great start to a fantastic New Year. I spent New Year's this year away from home. My parents and I went out of state and decided to stay in Savannah, Georgia (you probably can already tell that I was the one egging them on about staying there, hint, hint). We stayed at the Hyatt Hotel which was right in the middle of all the shops, old historical homes and buildings. Savannah, Georgia, is not only known for the old history that happened there but it is actually one of the top ten haunted cities in America. After learning this, almost every single store or building I went into I would ask the people who work there if it was true. Unfortunately, I would always get a yes which worried me because I am afraid of the unknown, such as ghosts One lady even told me she lived in a house that was haunted and that she always sees different ghosts around because she is a Medium. If you dont know what a Medium is, they are only a certain number of people who can see and communicate (meaning the dead can speak through to them) with spirits and ghosts. Over all, Savannah is such an amazing place to visit and stay. In one of the city squares we watched a beautiful wedding take place, which was so heartwarming. While my mom went and got a massage downtown, my dad and I decided to go to Old Fort Jefferson because we had an hour for ourselves. By the time we got there, it was closed. Then we went to one of the big cemeteries. When we got there, it was also closed. So about the time we made it back to the city mom was ready for us to come pick her up. We had fun driving around, though, and the next two days we went back to both places and they were open. One of the days there we went to a place calle d Tybee Island. It was raining, sadly, but my mom and I went out onto the beach to take pictures. Tybee Island is where they filmed the movie "The Last Song" starring Miley Cyrus and Liam Hemsworth. It is one of my favorite movies and, if you haven't seen it you should watch it; its definitely one of those movies that you'll remember forever. I do have to warn you, it is sad. Then after a week it was time for us to head home, and about this time I was home sick and missing my cats. Time we went over the bridge I got so relaxed and giddy at the same time thinking, 'Yes I'm home!' I saw my two cats Peanut Butter and Patches, and I ran and picked both of them up. They, of course, tried to get down but I was so happy to see my fluffy babies! I loved Savannah, but I dont miss the ghosts at all. Homecoming is almost here, and I am so excited because I am on court again this year! I can't wait to get my dress and feel like a princess on the red carpet again. Please come and support our school and basketball team! We want to try to get everyone to come and watch the game, the cheerleaders routine, and the homecoming court. It is on Friday, January 17, and you can call the school for times and more information at 695-2561. I would love it if you all came and watched me on the court in my dress and our cheer routine after! Excited for Homecoming 2014! Love, Savannah Savannah Oglesby is a student in the 11th grade at Everglades City School and a regular contributor to this paper. The MULLET RAPPER Whats Happening in the Everglades City Area JANUARY 17, 2014 email: mulletrapper@gmail.com PAGE 12 www.evergladesmulletrapper.com The MULLET RAPPER Whats Happening in the Everglades City Area PUBLISHER Patricia A. Huff, Snook Publications P O Box 617, Everglades City, FL, 34139 (239) 695-2397, mulletrapper@gmail.com EDITORS Patty Huff & Marya Repko CONTRIBUTORS to this Issue Helen Bryan, Taylor Dahlke, Chester Keene, Elaine Middelstaedt, Savannah Oglesby, Chuck Raney, Charles Sboczak, Shannon Snyder PRODUCTION layout: Marya Repko, printing: Hinson Studios PUBLISHERS STATEMENT We aim to provide local news of interest to the extended community of Everglades City, Chokoloskee, Plantation Island, Lee Cypress, Copeland, Jerome, and Ochopee. We strive to present the facts accurately with no political bias or personal opinion. The views expressed in signed articles are not necessarily those of the editors or publisher. SUBSCRIPTION RATES 25¢ per issue or $38 per year by US Post 2014, Snook Publications. All rights reserved. No part of this publication may be reproduced without prior permission. www.evergladesmulletrapper.com SNOOK CLASSIFIEDS -----------------------------------------------------------FOR SALE : 2008 Nissan van, 109k miles ,loaded, 28 mpg, very good condition.$7900. (228) 596-4043. -----------------------------------------------------FOR SALE Manufactured Home, 3/2 on waterfront in Plantation Island: walkway / mooring to water. Pr ice $114,500. Call Pat (239) 352-7328. -----------------------------------------------------WANTED: All Motor Homes, 5th wheels and travel trailers. Any condition. Cash paid on the spot. Call Paul at (941) 347-7171. -----------------------------------------------FOR RENT: 10 x 10 Storage units at 103 S. Storter, $60 a month. Call Deb at 695-9267. -----------------------------------------------------FOR SALE OR RENT TO OWN: House & Barn on 1.02 Acres in Fakahatchee Strand State Park, $139,000 purchase or $1200 monthly Rent to Own. Call Don at 321-439-7635. See more info & pictures at www.DonsHouse.com. ------------------------------------------------FOR SALE Last of the old Chokoloskee Cruisers ALBATROSS II For details: (239) 455-1567 or captfrankadams@aol.com -----------------------------------------------SNOOK CLASSIFIEDS only $10/issue phone 695-2397 or email JOBS & SERVICES -----------------------------------------------Music Lessons and Tutoring for students: violin, piano, voice, history, English, writing, science, 5th grade subjects, 3rd grade subjects and "much more" Call Danielle Swis her at 280-8971 or email dmswishe r85@gmail.com. YearRound Jobs: Camp Staff in nearby Ochopee. Drug/Background screens/H.S. or GED required. Send re sumes to bigcypressbm@amikids.org or call 695-1001 for info. -----------------------------------------------Notary Public Services Denise Johnson, By Appointment 308 Storter Ave South Everglades City, 239-465-1580 -----------------------------------------------Job Wanted: Pressure cleaning homes, boats, RV, store fronts, etc. Call Justin at 695-5930. -------------------------------------------------WANTED : Automotive Window Tinter Certain Requirements Apply. Call 695-3667. -------------------------------------------------WANTED : Cashier, full-time, Gator Express. Call 695-3937. VOLUNTEERS NEEDED Greet Visitors in the Museum Meet people from around the corner or around the world! Phone Martha at 695-0008 Everglades Area Hot Lines Alcoholics Anonymous (AA) 313-530-3395 AlAnon 239-263-5907 Narcotics Anonymous (NA) 239-776-1525 12-Step Meeting Schedules are available in City Hall and Chokoloskee Post Office ANNUAL SUBSCRIPTIONS date _______________________ Please make check payable to Snook Publications and send to Snook Publications, P O Box 617, Everglades City, FL, 34139 ___ The MULLET RAPPER by post ($38) ___ The MULLET RAPPER by email ($10) NAME ___________________________________________ EMAIL _______________________________________________ STREET / P.O.BOX: ALTERNATE ADDRESS _________________________________________________ ______________________________________________________ CITY ____________________________________________ CITY _________________________________________________ STATE ________ ZIP ____________________________ STATE _________ ZIP _________________________________ MONTHS AT ALTERNATE ADDRESS __JAN __FEB __MAR __APR __MAY __JUN __JUL __AUG __SEP __OCT __NOV __DEC 1/17/14 PET PICS Lisa Marteeny sent in this picture of Killer snuggled on his daddy's lap on a cold evening. Send us your Pet Pics by post or email. See the Rapper in full color! Visit our website.